This smart board lesson was created to provide students with place value practice activities (ones, tens, hundreds). Students will view and use digital base ten blocks to identify, understand and create 3 digit numbers. 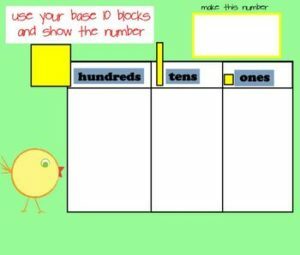 Some pages can be used while students use their own base 10 blocks and mats. The file includes a teacher’s notes page, interactive pages, links to interactive websites and links to printable worksheets. Some pages could be used for instruction and modeling. Use a few pages as a warm up to your math lesson, use a group of the pages as a practice lesson or use a single page. The file is very flexible. I included a few “master” pages where you can create additional practice pages by typing in your own numbers.